Syllabus of the Online Course (Subject): European Committee of the Regions (EU). Learning materials in or Comité Regiones UE Comité des régions de l’UE Comité Europeu das Regiões. The Committee of the Regions of the European Union acts as the assembly of local and regional representatives of the European Union. It is made up of 350 representatives from all the countries of the European Union (Europe). These representatives can influence the policies and legislations related to their cities or regions. 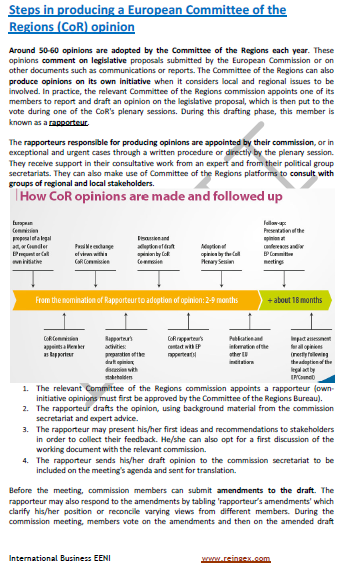 The European Committee of the Regions consists of 350 members, six commissions and five political groups. It usually holds six plenary sessions annually. One of the objectives of the European Committee of the Regions is to bring the European Union closer to its citizens. The European Committee of the Regions was established in 1994. The Committee of the Regions of the European Union expresses its views on issues such as economic cohesion, social affairs, transport, education, employment, public health or climate change. All the countries of the European Union (Austria, Belgium, Bulgaria, Croatia, Cyprus, Denmark, France, Estonia, Finland, Germany, Greece, Hungary, Ireland, Italy, Latvia, Lithuania, Luxembourg, Malta, the Netherlands, Poland, Portugal, Slovakia, Slovenia, Spain, the United Kingdom (BREXIT), the Czech Republic, Romania, and Sweden) are members of the European Committee of the Regions. The European Committee of the Regions belongs to the European Economic Area (Western Civilisation).